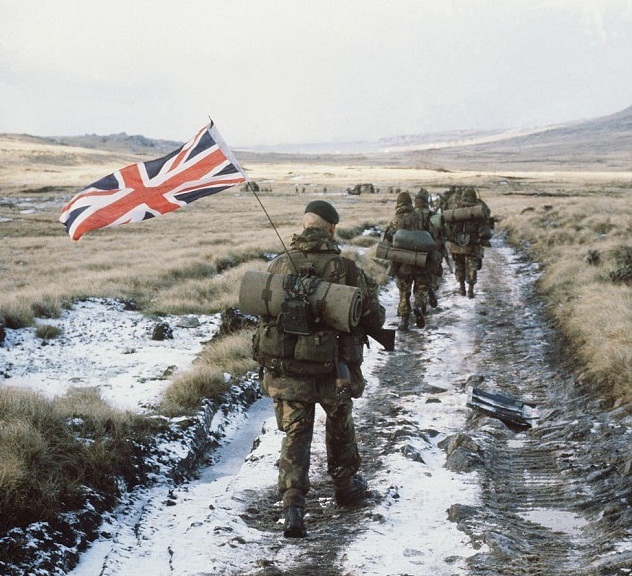 British troops on the Falklands in 1982. It is incredible to think that it was more than 30 years ago that many of us sat glued to the television news and watched the Falklands Conflict unfold. ‘Bomb Alley’. Goose Green. Mount Tumbledown. Bluff Cove and Fitzroy. Port Stanley. Mirage fighter jets. Exocet missiles. The Sun’s ‘Gotcha’ headline, the of the sinking General Belgrano, the explosions onboard HMS Sheffield and the blazing Sir Galahad are etched in our memories. This was 1982. There was no internet, no social media and no mobile telephones. It was the first time that a major conflict involving British forces had been played out through nightly TV news bulletins – the colour images (for those who had colour televisions) bringing the horrors of war into our living rooms like never before. During the months of April, May and June, the country held its breath for what seemed a very risky undertaking – i.e. sending a task force 8,000 miles away for a scrap on the aggressor’s doorstep. Only afterwards did we learn what a close-run thing it was, just how much of a gamble it had been and how ill-prepared for war our Armed Forces actually were. The conflict lasted only 74 days but resulted in the deaths of 649 Argentine military personnel, 255 British military personnel and three Falkland Islanders. Caught up in the euphoria of a remarkable, improbable victory voters returned Maggie’s government to power and the rest, as they say, is history. Three decades after Argentine forces on the Falklands surrendered the country’s government is again ratcheting up the tension. Most Argentines regard the islands, which they refer to as Las Malvinas, as belonging to Argentina and their recovery is even enshrined in the country’s constitution. It was tub-thumping by Argentine politicians in recent years which prompted the referendum that took place in the Falklands over the last two days. The result may have been entirely predictable but it was nevertheless important that voters went through the motions. When Falkland Islanders voted on whether or not to remain a British overseas territory, they were demonstrating democracy in action. They were telling the rest of the world that the majority of people on that group of islands in the South Atlantic want to remain British. In voting yes they also gave a ‘hands off’ warning to the Argentine government. According to Argentine President Cristian Fernandez de Kirchner, of course, the wishes of those inhabitants are irrelevant and the referendum is a pointless exercise. For her government this is a purely ‘territorial issue’ and thus they often dust off ancient manuscripts to claim that Argentina inherited the islands from the Spanish crown in the 18th Century. The British government denies this is the case and claims it had long had a settlement on the islands prior to 1767 and has never relinquished sovereignty. Interestingly, even Spain with the rock of Gibraltar irritatingly close, refuses to support the Argentine cause. Whatever the complex truth, the people of the Falklands have spoken and, in the time-honoured tradition of self-determination, that should be game, set and match as far as the international community is concerned. If the Islanders want to remain British then that’s certainly good enough for me, it’s probably good enough for the British people and it should be ammunition enough for the Foreign Office to tell the Argentines to bugger off once and for all. I can imagine what Maggie would have said the day after such a referendum. 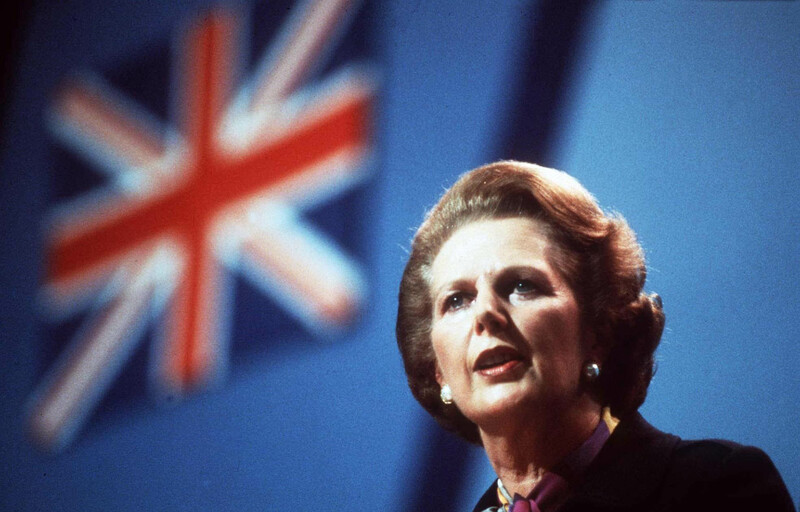 People can say what they like about Margaret Thatcher’s economic policies but when it came to Britain’s standing on the world stage the fact is we haven’t been taken anything like as seriously since she left Downing Street. Her handling of the Falklands Conflict, her refusal to negotiate, to back down or to consider the possibility of defeat showed the mettle of a great Prime Minister in the mould of Winston Churchill. What a shame her successors have all been vacillating, pale imitations of the kind of statesmanlike figures this country desperately needs. Some will argue Maggie went to war to help her win the General Election but if you read accounts of the time you’ll see she went to war because her generation thought that standing up to a dictator was the right thing to do. Given the effects of the global economic downturn and the every-day worries we all have the sovereignty of the Falkland Islands may seem a fairly low priority at present. What’s more, given the fact that the Royal Navy doesn’t currently possess an aircraft carrier worthy of the name, it is a matter of some debate as to what would happen if lightning struck twice. I fervently hope history does not repeat itself. However, I’d like to think that if push came to shove this country would defend its overseas territories just as it did 30 years ago. I’ll leave the final word on this issue to Eric Barbour, of Waterhayes, who I interviewed last year on the 30th anniversary of the invasion of the Falkland Islands. Eric, who was a 26-year-old with 42 Commando Royal Marines in 1982 and part of the Falklands Task Force, is unequivocal. He said: “We saw it very much as our country protecting what was ours and protecting people who did not want their home to become part of Argentina.